Jands’ award-winning Vista lighting and media control system has been embraced by leading designers, companies and venues around the world. The platform allows all levels of user to get the most from whatever mix of technology they have available, whether dimmers, moving lights, LED, or media. Utilising the same Vista v2 software, there's a choice of all-in-one Linux consoles and control surfaces running natively on a Mac or a PC. Jands UK dealer, A.C. Entertainment Technologies Ltd. (PLASA stand P41) will showcase models from the Vista hardware range, including the new Vista D1 playback processor. When connected to any host console from the Vista family, each D1 allows control of an additional 8192 DMX channels to help cope with the increasing channel counts being used in today’s designs. 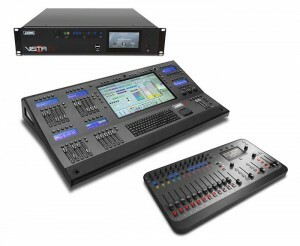 Jands will also showcase new features for their award-winning Stage CL console. These include a second page of fixtures allowing intuitive control of up to 24 groups of LEDs or dimmers. Leading the way in innovative lighting control, and specifically designed for LED fixtures, the Stage CL provides twelve direct fixture control channels, powerful yet simple storing and a touch-screen interface, all packaged in a compact and elegant chassis. Stop by the stand to receive a hands-on demo of the Jands product range and meet the Jands experts. In picture: Jands Vista D1 playback processor, Jands Vista L5 lighting and media console, and Jands Stage CL LED control console.